Seventh edition, revised, 8vo, pp. x, , 254; 20 engraved plates, text illustrations throughout; contemporary full dark brown morocco elaborately blind-tooled, previous owner's initials "VR" lettered in gilt and blind on covers, all edges red, marbled endpapers; extremities show some scuffing, else very good and sound. An artistic take on human (and horse) anatomical expression. 7th edition, revised. Binding loose. Cover worn. Backstrip scuffed. Hardback, Ex-Library, with usual stamps markings, with previous owner's name inside cover, in fair condition, suitable as a reading copy, no dust jacket, 251pages. "Fifth edition". Quarto, original red cloth stamped in blind and gilt, black endpapers. pp viii, 275 + 4 engraved plates at rear. Many vignette engravings in text. Pages (231)-68 contain an addendix "On the Nervous System" by Alexander Shaw. Contains the posthumous Preface to the Third Edition. Spine ends a bit frayed, wear along bottom fore margins of lower edges of covers; short cloth splits to joints neatly repaired, only minor light scattered foxing in text, nice bookplate inside front cover; else a VG clean, tight and unworn copy, text quite clean, hinges not cracked. Sir Charles Bell (1774-1842) was a Scottish surgeon, anatomist, neurologist and philosophical theologian. The present work, one of many from Sir Charles, was first published in 1806 as Essays on The Anatomy of Expression in Painting. Bell's studies on emotional expression, flawed though they were, played a catalytic role in the development of Darwin's considerations of the origins of human emotional life; and Darwin very much agreed with Bell's emphasis on the expressive role of the muscles of respiration. Darwin detailed these opinions in his The Expression of the Emotions in Man and Animals (1872), Note: heavier parcel, extra shipping will be required. Very good(+) 20 plates and several illustrations throughout the text. 251 pages, 12mo, full blind stamped brown morocco, gold crest on front cover, rubricated edges. Loondon: George Bell, 1877. Very good (+). 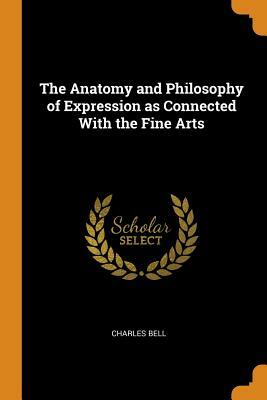 "Bell's artistic and literary skills combines with his knowledge of anatomy and physiology to make the work a tour de force of art history and the anatomical and physiological basis of facial expression." GM 6604.92.